1. Place the beans, tomatoes, ketchup and Worcestershire sauce in a saucepan and bring to the boil, simmer for 10 minutes, stirring occasionally. Season. 2. 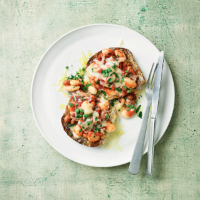 Sprinkle half the cheese over the toast, top with the beans and sprinkle over the remaining cheese. Place under a preheated grill for 1-2 minutes until just melted. 3. Sprinkle with fresh parsley to serve.